By the beginning of 2009 I realized that something needed to be done. We had just returned from a fantastic trip to Jamaica with the entire family, staying at an all-inclusive resort. All-inclusive is code for “eat and drink everything in sight”, and I heartily did just that. As I reviewed the pictures taken during the trip I was shocked to see how much weight I’d put on over the years. At 45 years old my steady diet of junk food and extremely half-hearted attempts at exercise had converted my body into an awkward pear shape. A professional career of driving a computer everyday meant ready access to snacks and little natural exercise other than pounding away on a keyboard. My fingers were as lean and nimble as ever but that’s where the good news ended. The stats weren’t pretty: at 5’11” I weighed in at 206lbs, solidly into the overweight category. I wasn’t sleeping well because I snored loudly and suffered from mild nighttime apnea; after lunch I nearly always needed (though didn’t get) a nice long nap. Instead I pumped my body full of coffee and soda to get through it. I was up to size 38 pants and XL shirts, and worst of all my blood pressure was running as high as 153/80. My doctor told me that I would need to get on blood pressure medication soon. To add insult to injury my wife got us a Wii Fit. After stepping on the evil little device it decided my Wii character needed to look like a friggin beach ball, whereas everyone else in my family had normal Wii characters. On top of that the stupid Wii Fit made a noise that sounded a lot like "Oh My!" when I put my weight on it. I get it, thanks. It was a new year so I set a very specific goal for myself: I would get down to 175lbs by my 46th birthday in June. That 31lb drop would put me at the weight I was when I met my lovely wife back in 1985, a weight I hadn’t seen on my scale in 23 years. My good friend Jeff had dropped nearly 50lbs in a little over a year so I knew it could be done. I had the motivation, all I needed were the tools to make it happen. Diet & exercise are the key to losing weight. Who knew? Though I’m happy to share the foods I started eating and the exercising I did I won’t go into too much detail right now. Suffice it to say by counting calories, eating quality foods and putting in vigorous exercise I quickly started dropping weight. Initially it came off very fast, then I would hit walls that would take longer to see results. What I found out about myself was that I was highly motivated by seeing my goal weight and every few days checking on my current weight to see how I was progressing against that goal. I had read some good reviews of Weightbot and figured that since I had my iPhone with me all the time it would be a good tool for helping me track my progress. The thing I love about Weightbot is that it doesn’t try to be too many things. You enter your height, pop in a goal weight and from then on all you need to do is plug in your weight using a simple dial control. It’s got some great sound and visual effects so it makes it fun to use and even supports a WiFi based Withings Scale for data entry. Where it comes in handy is when you rotate your iPhone on it’s side and the goal chart appears. Not only does it present you with a chart of your actual progress with your goal displayed, it also gives you a projection of when you will reach your goal weight based on your current weight gain/loss patterns. I found this view to be a huge motivational tool. I really wanted to make it to my goal weight before my 46th birthday and I could tell early on how I was doing. At $1.99 Weightbot is a great buy and for me was well worth the money. 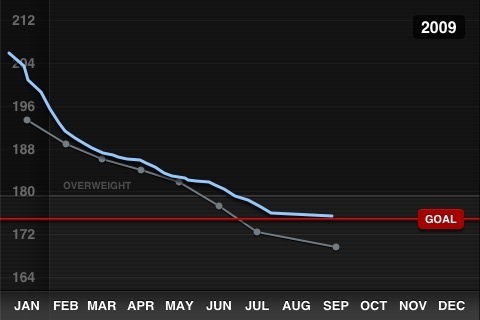 Unfortunately I missed my goal weight of 175lbs by my birthday - I hit it four days later. The results of losing that weight and learning to enjoy exercising had a profound impact on me. I went from a size 38 waist to a size 32 and from XL shirts to mediums. My blood pressure dropped dramatically and just a few days ago was measured at 112/71. I continued to drop weight, leveling out at about 170lbs with a measured body fat percentage of 9.9%. To my surprise (and my wife’s enormous relief) I stopped snoring after dropping the weight. Apparently I carried half that weight in my face and once it was gone my air passages were much clearer and I could sleep silently. This wasn’t of course because I spent $1.99 on Weightbot; that was just one tool to help me achieve my goal. If you are interested in losing weight and find that you are goal oriented, consider adding Weightbot to your toolbox. A huge part of my exercise regimen has been my newfound love of cycling. Recently I learned about the Tour de Cure, a bike ride to raise money to find a cure for diabetes. My father is a Type I diabetic and since the ride falls on Father’s Day this year I decided I’d jump in and see if I could help them raise some money. I signed up to do the 100 mile “century” ride, my first attempt at that distance. I’ve been training like a madman lately and am shooting not only to complete it but to do so in less that 6 hours. Would you consider making a donation to the Tour de Cure and sponsoring me on the ride? If so, please click here. All the money goes to the American Diabetes Association and is tax deductible. Got an iPhone app that is great for helping people keep track of weight loss or exercise performance? Please drop a note in the comments! Good post. I have lost 60 lbs. (from 260 to 200) in the past year with exercise and the use of the Lose It iPhone app, which tracks calories and exercise. I found that it made the food to exercise relationship totally transparent. @pooter: 60lbs - that's outstanding! Well done. First of all, well done on losing the weight! I've been using the free version of RunKeeper on iPhone to keep track of walks I've been doing recently. It's a very nice tool, the only drawbacks being that you can't have anything other than iTunes going at the same time (which will be fixed by iOS 4), and it is touch and go whether the battery will last for the whole duration of long-distance walks. Good job on the weight loss and getting into shape! When I hit 160, 30lbs more than I weighed when I got married, I knew it was time to do something about the gain. This was about 3 years ago. I made changes to my diet as well, and changes to exercise. I'm back down to around 142lbs now. I've stalled there and haven't lost any more in a couple of years, but I'm happy enough where I am now. @Nigel: Battery life is a big issue when you use a live app during extended exercise. I'm hoping the new iPhone4 and it's larger battery will be a big help there. Some of my rides last up to 6 hours and it's hard to have an iPhone banging away with GPS and tracking software for that long, let along playing music. @Keleko: Thanks man! I believe the key to maintenance is being happy and keeping an eye on it. So much easier to drop a few pounds when they pop on than to roller coaster it up and down every year or two. My main concern now is how I feel and my real health oriented measurements (blood pressure, cholesterol, resting heart rate, etc). @TK: Thanks. You'd be surprised how many calories you can burn with a 1/2" step! Sounds like a familiar situation: 46, 208 pounds, want to get to 185. Have already begun South Beach Diet and lots and lots of walking. Thanks for the article, just bought downloaded the app you mentioned. @pmf: Good job on setting off on getting in shape! Stay the course and don't despair. I had days where I would weigh in and find that I had gained 4lbs after making steady progress. Then a few days later I was back down and it would drop again. Weightbot is good at giving you a big picture view of your progress. Good luck! I will be 45 in August. I decided the same thing last year, and started out at the same weight (well, 207). I used various calorie counters on the iPhone, went out and got the Nike+ module and used that on my iPhone, and will now get Weighbot. As of now, I am at 175 and still dropping. My goal is 165 (I am shorter than you at 5'9.5"), but I imagine I will probably stabilize more at 160 or even lower. I also have not been this light since the 80s, and all those clothes I bought that "One day I will fit into" I now fit. It feels great, it is a permanent change, and everyone has noticed it. While I don't attribute my Mac to any of it (can you say sit in front of screen all day?) but I do definitely use the iPhone, whether it is listening to podcasts while making dinner, music while working out, counting calories and exercise on the go. The real change, however, came from determination, cutting my food intake by half, eating multiple times a day (instead of loading up at dinner, etc), and daily exercise. BTW, just like you, ailments went away. I used to have heartburn ALL the time, and considered it to be permanent, or that I had food borne allergies. I have not had a recurrence in months! Feels good to be in the land of lighter, healthier folks, doesn't it David? BMAZUR: Good job! I have lost 36 pounds since late fall with the help of my iPhone and I went from the couch to my first half marathon in 6 months. I opted for the paid version of Runkeeper to track my runs and hikes. I also got the reporting option so I can see my progress over time. It is very cool. I am starting to look a little too thin so went to the ap store once again and iFitness to build some muscle in my upper body and that has been working great. Finally I have been tracking calories and my diet with Lose It. @Eytan: That's great man, well done! I keep telling people how much better I feel. I'm nearly always in a good mood, have energy, etc. What strikes me is how when I look back I wasn't fat, I was actually sick. Bad food, poor care of my body, etc. I hope I don't come across as bragging—my goal is to help inspire people that are just letting their health ride off. Life's short enough as it is, I'd love to see people enjoy it more. @BMAZUR: Couch to half marathon in 6 months is great man - 13.1 miles is NOT easy. Well done on that weight loss! I like to tell people it's not about going on A diet, it's about changing your EVERYDAY diet. Now it's just ingrained in my head. Some of my bike rides burn in excess of 4,000 calories so I'm nearly always operating at a deficit. Good luck on your upcoming ride. Have you thought about a camel for water? I'm a 57 year old old guy who woke up one day weighing 326. I thought they were gonna move me back to tackle! (The fat guys' position) My playing weight in college was 195. Then I read "Younger Next Year" by Chris Crowley & Dr. Henry S. Lodge. That was the book that set me in action to take control. I highly recommend it even for you "younger" folks out there. They also have a version for women. One of the requirements was to keep a food/exercise log. Fat chance of that happening I thought, until I found the free "LoseIt" app. I use it daily and even have some family friends using it too. It's great. For my bike rides, I'm using the "MotionX" app. It's not as accurate as my bike computer but it can crank the tunes. For weight training, I'm using an adjustable kettlebell. Walmart has one that goes from 5 to 20 lbs. I'm currently on 15 lbs. There's also a free "Kettlebell Timer" app. I'm gonna try it for a year and see what happens. I'm currently down to 259 w/ a goal weight of 177. I can't tell if I'm any "younger" yet but I'm starting to feel better & somewhat stronger. "I like to tell people it's not about going on A diet, it's about changing your EVERYDAY diet. Now it's just ingrained in my head. Some of my bike rides burn in excess of 4,000 calories so I'm nearly always operating at a deficit." Congratulations, David! I was almost reading my own story on this post! Jan '09, I was 5'9", 209lbs, 45 years, and my doctor said "borderline diabetic, low good cholesterol, and chronic acid reflux, you need to loose weight". So with the help of LoseIt! 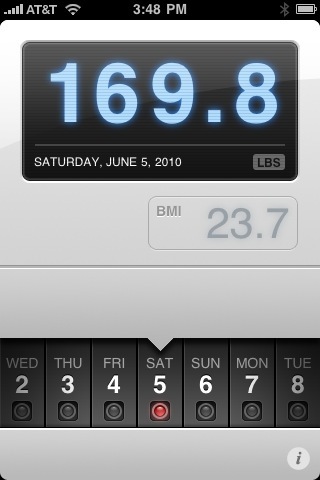 on the iPhone, the Nike + iPod, Wii Fit, and my seldom used Gym membership, by October I was at 165lbs. I am also now 46, and I have pretty much stayed that level since, with the change in lifestyle (as you mentioned, it's not 'diet', it's 'lifestyle change'). My heartburn was gone and so was the daily Aciphex pill. My snoring and apnea were gone (my wife is oh so thankful). My 32" waist is back, M sized shirts (loved getting to buy a new wardrobe due to clothes no longer fitting!). Only thing left is my Dr says the borderline diabetes is still there, and I need to loose 5-10 more lbs. It's hard now, after a 45lb loss, to get that extra 5-10, but I'm committed to it. Congrats again and thanks for letting me share my story! @Anon: Sounds like you're on top of it - that's great! Just keep plugging away. I look at my parents and the health problems they are having now and so much of it could have been offset with diet and exercise. I've been hearing a lot of good things on the LoseIt iPhone app. Sounds like it's been a big help to a lot of people. @GPBrock: Thanks for sharing that Gordon. Sure, that last 5-10lbs will be tough but look how far you've come! If you haven't already you should take a look at adding cycling to your workout routine. It's been a life saver for me and I actually crave getting out on my bike. Since I'm usually indoors with my computer during the workday having an excuse to get outdoors and explore while getting a great workout is a wonderful experience. last year i wight 215lbs at 6ft 1. i started using nutrition menu (takes all the guess work out of calorie intake). it has every major restaurant and most grocery store items. even has a way for you to enter items and save to use stats again. this allowed me to eat properly, while exercising (keeps track of that too). i dropped to 178lbs by end of summer. look it up at the app store. sadly i switched to night shift and stopped using the app. the weight is back. so i'm using it again, wish me luck. @Gregory: You can do this - no luck needed! "Battery life is a big issue..."
My husband had a similar incident earlier this year - February, instead of January. He decided to lose 10 or 15 lbs, by trying the South Beach Diet. My mom used it (dropped 40 lbs) and my dad (a doctor) recommended it, so we thought, why not? He was 183 (5'8) to start, and also had a beachball WiiFit profile guy. He was not happy to see my normal one either! Now, he's at 150lbs, which is only 5 lbs shy of the "ideal" of 145. He never thought it would be like that. We've been using the WiiFit as a scale, and since we don't have iPhones, it works for us. My dad said that it just takes diet and exercise, and if you're not willing to exercise, you better change your diet. A change of diet and just moderate increase in exercise (considering we're mid-20s might also have something to do with the ease of loss) has really made a huge difference to him! Congratulations on your loss - I bet you are feeling wonderful and loving how your clothes look on you! I have lost 55 lbs in the last 18 months from a combination of calorie counting and cycling and am now smaller than I was in high school. After trying several iPhone apps I found I couldn't do it without Lean Me. It's on the higher end price-wise, but as a developer I'm not at all resistant to paying for good software. I've been using it since Nov 08 when it came out. Lean Me has a large database of foods with nutritional information and tracks calories, carbs, protein, fiber, fat, sodium, etc. It calculates calorie budgets based on weight using one of several calories and adjusts the budget based on logged exercise. It also tracks weight, circumference, body fat percentage, BMI, and several other statistics and shows several charts related to weight and fat percentage over time. The developers are also the most responsive, helpful, and friendly ones I've interacted with. Since losing the weight I've dropped to the lowest dose of asthma meds, haven't had trouble with reflux in months, and feel better than ever. I've even had to replace my entire wardrobe once and am working on a second time now. Just 10 more pounds to go! @Lee: I've got an external battery pack for the iPhone that should work. The dynamo hub looks interesting, much better than the old "eggbeater" style dynamos. @mrsjessica: Cool story - thanks for sharing that. Now that he's lost all that weight keeping it off will be a lot more fun. I do believe that in the US the single biggest problem is actually diet. The ready access food we have in this country is really horrible for you. Once you change the eating habits it becomes much easier. @Trisha: Well done! 55lbs is an incredible amount to lose! I am going to give this a try as I am just into my program and have yet to see any weight come off, thanks for this very informative post. What's more than amazing is not the results that you were able to obtain from the focus and dedication you have exerted in achieving your goal. Rather, it's your innate passion to share it with a far greater majority that can also benefit from your experience.